Once Vernon Johnson began painting watercolors of historical homes in Mount Vernon, requests came from many of his friends and professional associates for watercolors of their own residences. Such “house portraits” became a major focus of his work for the rest of his artistic career. Mount Vernon’s bank officers, physicians, automobile dealers, downtown merchants, corporate executives and others wanted to preserve these snapshots of their family legacies for display in their living, dining and family rooms and eventually for their children’s and grandchildren’s. And so did others in other places he lived as long as he was at his easel. My father, an active friend and colleague in social, civic and commercial circles and a community enthusiast, captured their surroundings through sensitivity and precision. To Dad, “home” was everything really. It was where the family re-engaged and, unlike our later workaholic lifestyles, where half of the day was lived — and enjoyed. It is clear to me that he thought that accurately capturing “time and place” was a major contribution for a family’s memories. To Dad, these paintings were as important as any watercolors he created because they would become cherished family pieces — and that’s exactly what happened. Reconnecting with some of these families, I can confirm that his perceptions and their motivations were deeply aligned. The children of my generation treasure these watercolors as reminders of their upbringing in 1950s Mount Vernon, an experience that has forever influenced all of us. In the 1950s, Vernon Johnson priced residential watercolors from $25 to $45, while landscapes and commercial buildings more typically ranged from $50 to $100. He did not simply recreate a photograph; his emotional engagement placed a residence or building in its local environment as a “landscape illustration.” Each tree, each finial, each doorway ornamentation — all are important for historical accuracy, and I continually hear about how Dad’s work is revered because it reminds my friends of the detailed scenes of their childhood. As 1950s residential architecture changed, historical structures exemplified tradition while modern “ranch homes” and other hybrid designs tracked progress and prosperity. 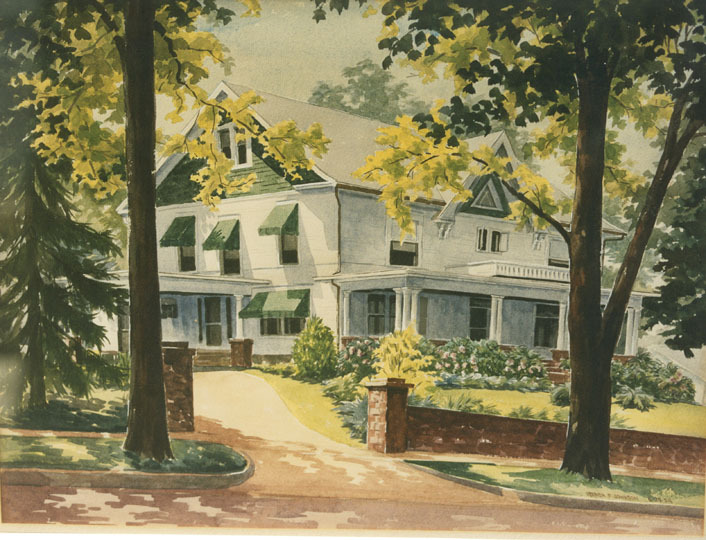 Dad’s watercolor commissions and gifts were very personal to the families who enjoyed them (as they are even today) and, collectively, chronicled more than a century of architectural diversity in Knox County. From Mount Vernon to Gambier, the new blended with a solid historical footprint — and all of this became part of Dad’s palette. I have signed and numbered print by Vernon P, Johnson, “Governors Manison” How can I find out value?